Christians in Science, an international network of those concerned with the relationship between science and Christian faith, open to scientists, teachers, students and all those with an interest in this dialogue. Provides a wide range of resources, an annual conference and has many active local groups across the UK. If you’re looking for a place to start thinking about science and faith, where better than Christians in Science’s ‘Thinking About’ series. They’re simple, quick to read and understand, written by experts within the science-faith community, and give some really helpful recommendations if you’re inspired to learn more about that topic. 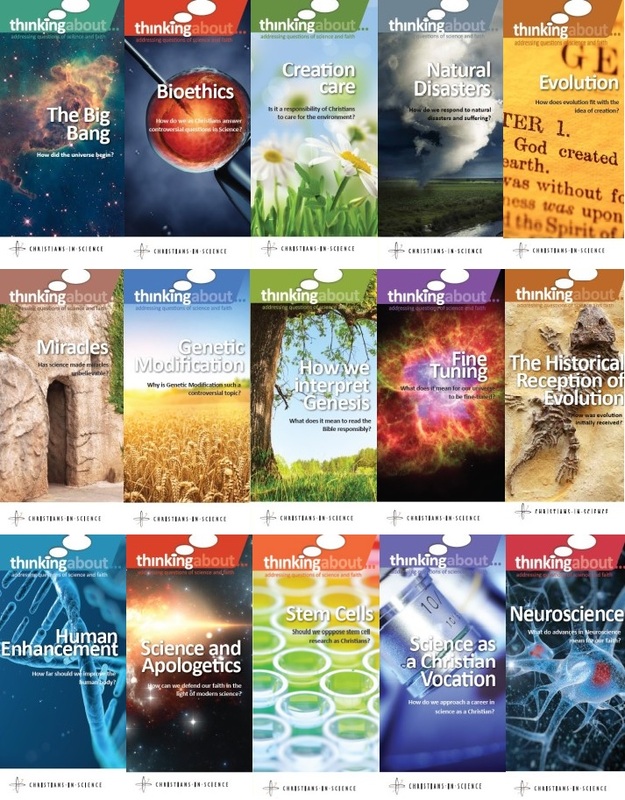 Some of the exciting titles of Christians in Science’s ‘Thinking About’ series! The BioLogos forum is an American organisation founded by Francis Collins specifically to distribute resources on science and faith. Test of FAITH, Introductory resources from The Faraday Institute on science and faith. The Faraday Institute, based at St. Edmunds College Cambridge, supports God and the Big Bang closely and has a huge range of lectures and other resources. Faraday Schools, part of the Learning About Science and Religion (LASAR) project, providing online resources for Key Stage 3-4 pupils and teachers.